Editor's Note: Jerry Newberry, Communications Director for the Veterans of Foreign Wars, is currently embedded with the troops in Afghanistan. We as a people need to know about the heroes who are fighting our wars. The honest-to-God heroes, not the phony, overpaid over-hyped and too oft-publicized types. The heroes I’m talking about are ordinary people under most circumstances but end up doing extraordinary things because they are suddenly thrust into extraordinary circumstances. War is one of those circumstances. Doing appropriate justice to real heroes is a high mark to try and reach. How do you adequately convey their remarkable stories in a way that serves them - and the memory of their sacrifices - suitably well? After all, it’s not just the moment in time when the event, the act, actually occurred that is important, or even the deed itself. The essence of the story and the deed lies instead with the person behind the act. So this is my attempt at telling you the story of an American hero. Corporal Angelo J. Vaccaro had finally found his place in life in the Army, and as a senior line medic, with the 1-32 infantry, 10th Mountain Division. It wasn’t always like that for Angelo. Born in the Bronx, and as that borough sometimes requires, he became a tough and street-savvy kid. He didn't live his entire life in the "B", however. The Vaccaro family - Mom, Dad and 5 siblings - eventually moved south to Miami. Angelo was tired of his life going nowhere. Working at Wal-Mart as a stock-boy wasn’t cutting it. He yearned for something better. So he made a decision. He enlisted in the United States Army "to turn his life around... to save himself." He opted for training in the medical field. After basic training and AIT at Ft. Jackson, South Carolina, he was assigned to 1-32 Infantry, 10th Mountain Division, as Attack Company’s 3rd platoon line medic. His imposing physique and outgoing and somewhat brash personality made him hugely popular with his fellow soldiers. But what really endeared him to the troops was the fact that Vaccaro did what combat medics have always done­ - he unfailingly put the needs of his fellow soldiers first, before his own. Angelo Vaccaro had found a home. 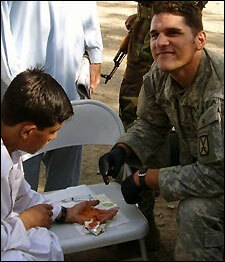 Corporal Vaccaro eagerly sought to learn everything he could about the job as a medic. He easily assimilated knowledge from his counterparts, higher-ups and various Army schools. He was determined to be the best combat medic in the battalion, and his mantra was "if you can do it better, then show me how!" The Army had transformed him. He had grown as a person and into a man and now he was focusing on the future. His short-term goal was to attend 91WM6 (nursing) school and eventually, as a long-term goal, to attend the Army Physician School. After deployment to Afghanistan, Cpl. Vaccaro participated in a nunber of operations throughout the Peche River Valley, Watarprpur Valley and Korengal Valley. He conducted more than 40 mounted patrols and well over 100 dismounted patrols. In June, Vaccaro's platoon came under heavy enemy fire. The platoon suffered five casualties, Vaccaro being one of them. Undaunted by his own injury and still under heavy fire, Vaccaro ran to asist the most seriously injured soldier, covering his comrade with his own body while returning suppresive fire towards the enemy. Still under fire, Vaccaro dragged the wounded soldier to a safe area and began treating his wounds. He then moved on to treat the rest of the casualties. On a different operation, Vaccaro evacuated three wounded soldiers from a 7500 ft ridgeline by carrying them one-by-one over his shoulder out of the line of fire. He then treated and stabilized them while the firefight continued. The other night, Doc Vaccaro was serving as the senior line medic at the Koregal Outpost TOC. The radio came alive with news that his platoon, HIS soldiers, were involved in a heavy firefight with the enemy and had suffered two casualties. He immediately volunteered to leave the outpost and help conduct an extremely dangerous ground extraction. Despite clear and immediate intelligence that a ground evacuation would be attacked, Cpl. Vaccaro knew that medical intervention was needed at the site of the fight. As he arrived at the scene of the engagement and was attempting to evacuate the casualties, Cpl. Vaccaro was struck by enemy fire and instantly killed. Angelo J. Vaccaro is more than a statistic. He was a young man who raved about his mother’s cooking, loved his family, loved his job and loved the soldiers he served with. When asked where he was from, he would respond in his heavy Bronx accent, "Miami", an answer that generated hoots of derisive laughter from his comrades. He was a perfectionist, a teacher and friend. He pushed himself and others around him to the limit. Angelo loved cheesy 80’s music and would “jump like a little girl during scary movies,” but never flinch or falter when needed on the battlefield. Angelo had hopes and dreams and an entire lifetime ahead of him. He epitomized the long line of combat medics who came before him and the long line of medics who will continue to serve as long as we call on our soldiers to fight our wars. He is representative of all of the soldiers of the 1-32 Infantry, as well as the thousands of other servicemebers who are serving today. Corporal Angelo J. Vaccaro won’t be forgotten by those whose lives he touched on a daily basis. He won’t be forgotten by his family and friends or by the comrades he tended and mended to or by those whose lives were saved because of his actions. This is the story of Angelo J. Vaccaro. A real American hero.